My very first job was working at my parent’s millwork shop. The aroma of wood being cut is still a very familiar and comforting one to me. With this family foundation, I began designing kitchens and baths when I was 13 years old and I never stopped. Over the years I’ve seen the industry change and grow firsthand. From the small space tucked away at the back the house to the open layouts we see prominently placed at the center of our home and lives, we no longer hide our kitchens. The walls have literally and figuratively been torn down. Now the kitchen is front and center in the home and has become the focal point—the center of activity. Meal preparation is just one function of today’s kitchen. Americans live in their kitchens, even if they are not avid chefs! With so much attention placed on this one space, we have upped the “lux value” with stunning finishes, super high-tech appliances, enormous islands, and yes, even TVs have made their way into many modern kitchens. 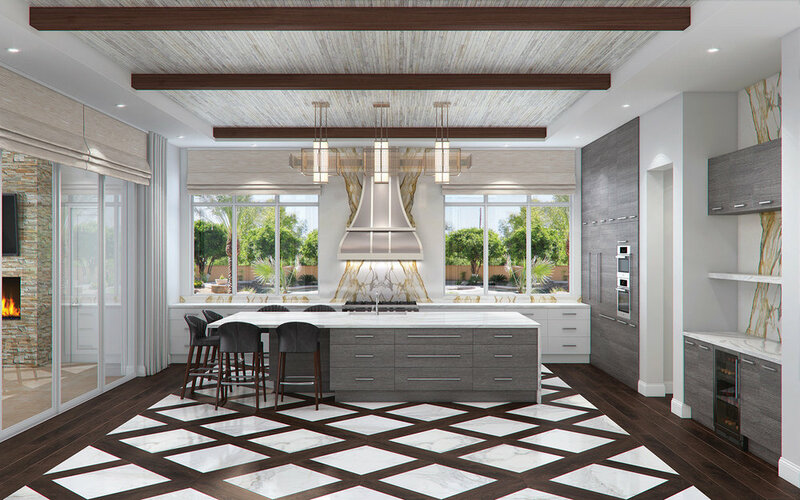 Details like the wood and marble diamond floors and the ceiling details make this photo-real rendering come to life. These designs are used to show clients exactly what their kitchen will look like alleviating the fear of the unknown as we embark on their design process. The strongest trend today is the shift to a kitchen that looks less like a kitchen. This is accomplished through the introduction of integrated refrigerators, wine coolers, and dishwashers by high-end appliance manufacturers. Appliances now look like cabinets and some companies, such as Miele, completely disguise their products as cabinetry or wall panels. Integrated appliances allow us at K2 Design Group to create kitchens that are a part of the architecture and design of the home, not just purpose-driven cooking areas. Consumers are also demanding more function in the kitchen. From barista-style coffee at the push of a button to perfectly prepared dinners in chef-inspired appliances, people expect more from their kitchen than ever before. I personally enjoy a 6:00 a.m. macchiato every morning compliments of my Miele coffee machine. I also love being able to steam fresh vegetables, bake crusty loaves of breads, and broil flaky fish in my combination steam and convection oven. I can even cook in sous-vide mode in the same steam oven. My duel-fuel gas/electric range has two convection ovens but one is also a microwave—and there is a warming drawer. When it comes to dinner preparations I have more options in my home kitchen than most chefs did a few years ago! Lighting in your kitchen is vitally important. Not only the color and temperature but also the how the lighting is laid out so there are no shadows and dark zones as you move around the space. LED lighting also allows designers to add decorative options that really create a wow factor. I’m also excited about the combination of design and technology. We are now combining technology not just with appliances, but also in cabinet finishes. New, digitally-printed cladding for cabinets allows us to design kitchens with very specific personalities. Another major focus in our kitchen design is lighting: decorative and embedded. We use LED lighting in our designs because the sky is literally the limit here. We also love LED lighting because we can make sure the color of the light is appropriate for the space. While it seems the restrictions have been removed, manufacturers have listened to designers, and we are free to let our ideas soar. Note, there is one trend in kitchen design that should go away immediately: sparkles in countertops! There is a real danger in using a trendy design idea like sparkly flakes in the third most expensive purchase in a kitchen (after cabinets and appliances). I remind my clients that their countertops are a decision they may have to live with for 20 or more years! Kitchens have become a work of art unto themselves. Now a prominent space in the home, they need the same care and attention any other room would get. This is now the space you live and entertain in so add unique items like colorful stone backsplashes or fun counters. Perhaps the biggest change I’ve seen in kitchen design is my own growth as a designer. When I was younger, I was a creative designer but as I’ve matured, I have realized the immense value in explaining the design process to my residential clients. One of the best ways I do this is through hand-sketching their kitchen, showing them their options in real time. I became proficient in quick sketching because I like the connection between my client and myself. We sit at the same table and dream together. These sketches are sent our drafting department (it takes a village! ), and once finish selections are made, they progress to our rendering department where we craft photo-real 3D images. This has changed everything. Thanks to our ability to provide full-color images that look like actual photographs, our clients don’t fear the unknown. We also give each K2 Design Group client a complete run-down on “how things work” at the initial consultation. It takes the edge off right away and allows us to move through the fun of the design process without tension. I truly believe this gives our valued clients peace of mind which is a key component to their satisfaction with the project. As you set out to create your dream kitchen, get excited! You are working on your new kitchen at a time where there are so many amazing options from finishes to appliances, that you can truly create a unique space that fits your personality and style. Jenny Provost, owner and Principal Designer of K2 Design Group, has a reputation for creating impressive, dramatic, and exciting designs. Jenny studied Architecture at McGill University in Montreal, Canada and opened her own Naples firm in 1994. K2 continues to innovate the fields of interior design and design architecture as Jenny challenges standards by infusing classic concepts with global exploration.